Rio de Janeiro, Brazil's second-largest city, awoke to scenes of chaos on Thursday after thrashing wind and rain whipped through neighborhoods, felling trees, flooding streets and sweeping away buses in a storm that killed at least six people. 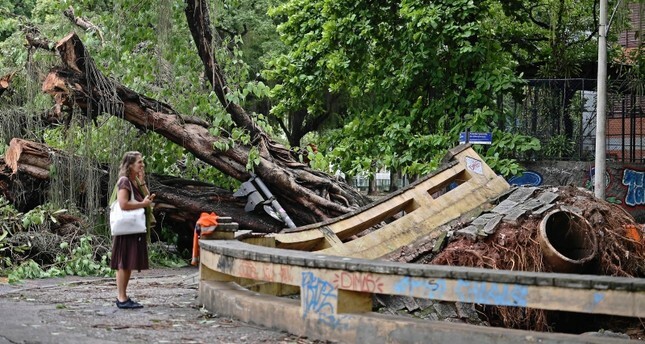 Some of Rio's most iconic neighborhoods, including tourist hot-spots like Ipanema and Copacabana, were battered by winds of up to 110 kilometers per hour (68 mph) on Wednesday night, with precarious hillside favelas hit by mudslides that closed roads. At least six people died, with one more person potentially killed in a bus that was hit by a mudslide, Rio's mayor, Marcelo Crivella, told local news media. "It was a lot of water that ended up causing this tragedy," Crivella said. "It was unexpected." The storm came just days after Rio experienced its hottest January in 97 years, with some days reaching as high as 42 degrees Celsius (107.6°F). On Thursday morning, doormen swept up branches outside upscale apartment buildings, while street-cleaners fanned out across the city, trying to bring order to the post-apocalyptic scenes. In Arpoador, on Ipanema's world-famous beach, a small sailboat was washed up on shore. The couple inside managed to escape when it ran ashore, local media reported. During Wednesday night, many people had been stranded in restaurants and bars when the storm hit, watching with fear and incredulity as winds tore through the streets, flattening signs and blasting parasols. TV images showed one man being swept away by a raging torrent of water that gushed through the Rocinha favela, while other reports displayed cars succumbing to the flow. Crivella noted that Rio was not yet out of danger, with more rains due later on Thursday. "They will be less intense rains, with less powerful winds," he said. "We ask that people stay in a safe location."